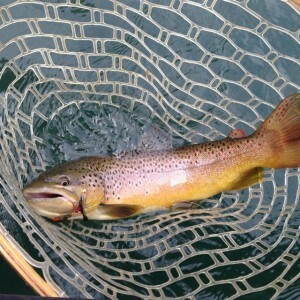 Last Thursday Bo got a chance to fish a little in the afternoon and the streamer bite got pretty exciting. 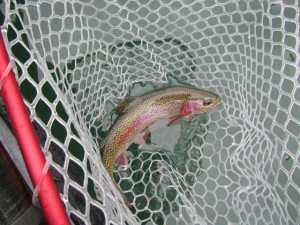 In only about forty-five minutes we netted four Brown Trout and a beautifully colored-up Rainbow all of which were at the upper end of the slot limit. Bo’s new ACC Streamer that he has been working on for a couple of months is really perfected and producing some real quality fish. All of our lakes are well above the conservation pool so as soon as the water levels in the eastern part of the state drop below flood stage the COE is going to run a lot of water on all of our rivers to get the lake levels back into the conservation pools. That will make the streamer fishing even better and we should be able to turn some big fish! 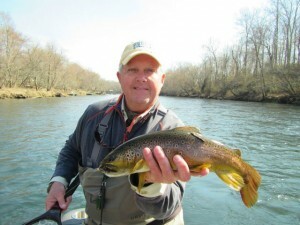 If you are interested in learning about our streamer techniques just book a trip with us at Empty Creel Fly Fishing Guides and Outfitter.